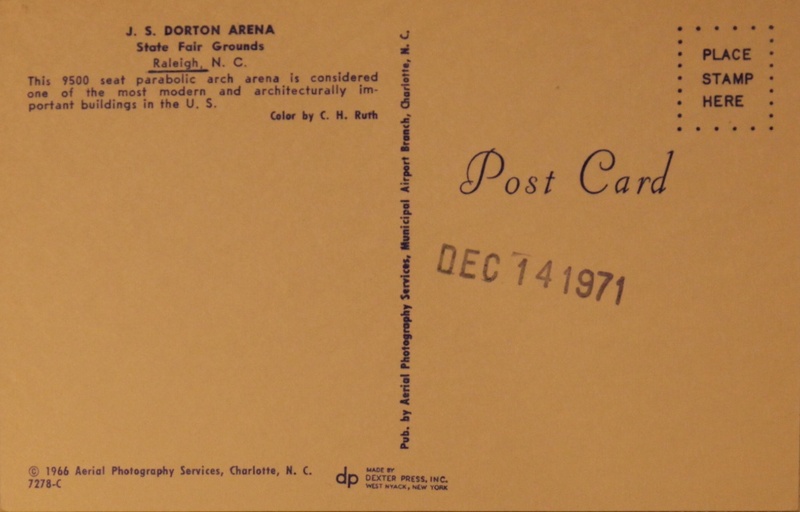 This week’s installment of Flashback Friday features a 1966 postcard of the arena designed by Matthew Nowicki at the North Carolina State Fairgrounds. Dorton Arena is the most significant piece of modern architecture in North Carolina, and probably all of the Southeast. This 9500 seat parabolic arch arena is considered one of the most modern and architecturally important buildings in the U.S. This unused postcard from Aerial Photography Services is dated 1966, and features a stamp from 1971. 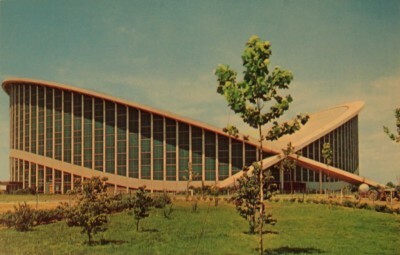 This innovative structure was built in 1952 and had a few nicknames, including the “Cow Palace” and the “Paraboleum.” The latter was the designer’s reference to the opposing concrete parabolas that provide support to the roof. The outer walls provide almost no structural support. 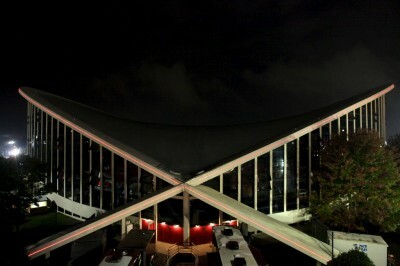 This structure was but one of a series of buildings of his larger master plan for the fairgrounds. Matthew Nowicki is likely the most noteworthy faculty member of the NC State School of Design, where he was head of the Department of Architecture. 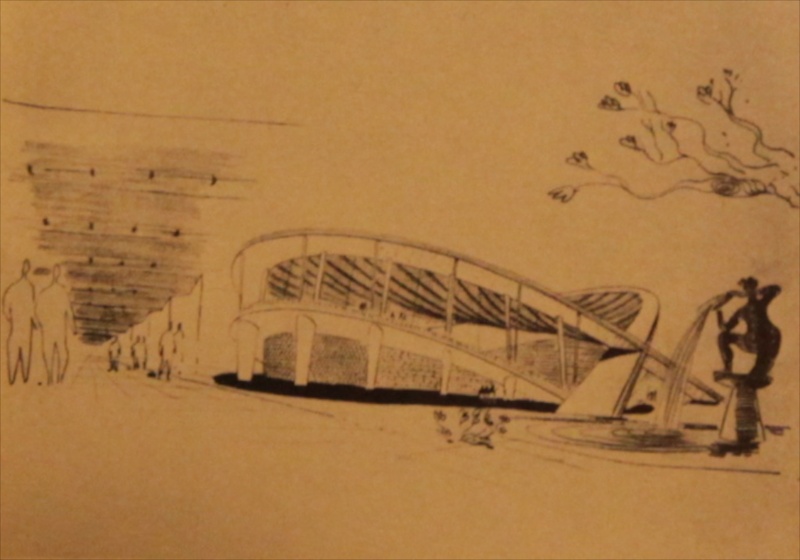 He had served as an architectural consultant to the United Nations building project, and was the chief city planner for the city of Warsaw before being forced into exile by the communist takeover of Poland after World War II. 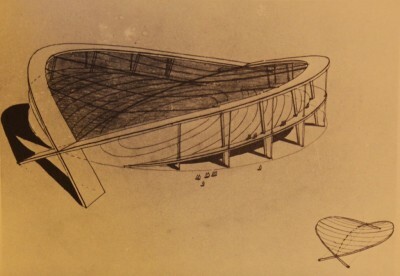 Sadly, he perished in a plane crash over Egypt in 1950, before he could see the construction of his ground-breaking design. He was returning to his home in Raleigh from the city he was in the midst of designing, Chandigarh. It was the first planned city of India, known internationally for its architecture urban planning. The full story of Mattew Nowicki and the Arena is too long to fit in to a Flashback Friday post, but is a topic we’ll be exploring in depth in the future. 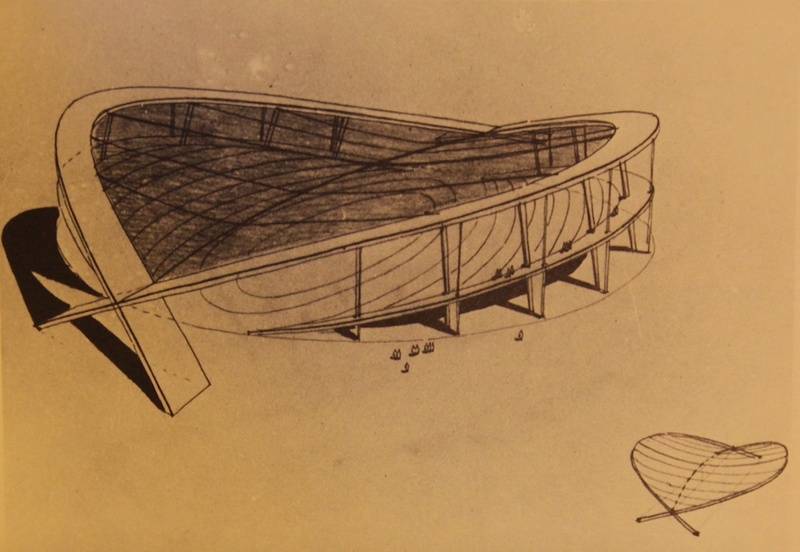 Although most sources consider Dorton Arena to be Matthew Nowicki’s only completed work in Raleigh, there is another local structure which was built from his sketches and vision. One of my favorite buildings! Would love to see this on one of the City Blocks. A stretch to say it’s the most significant piece of modern architecture in the Southeast. Just about everyone in Atlanta would argue that Portman’s Regency Hyatt Hotel (1967) deserves that accolade. I disagree with the Portman’s Regency Hyatt Hotel, only because, it also uses High Desert Dramaticism found in the Vegas mid-60s genre of design. Much like the Big Chicken. I am actually a fan of that kind of design, but, pure mid-century modern doesn’t have the eyesore factor. Besides, you haven’t lived unless you have both snowboarded and skateboarded on the roof of J.S. Dorton. Follow up on last comment. My goal in life is to time it so the satellite flyover used by Google Earth captures me carving the roof. Flashback Friday, huh? In 1970, my roommate and I hitched over to Raleigh from Chapel Hill to go to the State Fair. We copped some mescaline on Ashe Avenue and took the bus to the fair. By the time we passed through the gates we were flying pretty high and decided that the sounds and colors were, say, a little too intense, so we decided to climb to the roof of Dorton Arena. We went up to the peak of the parabola on the north side (above the current waterfall) and hung our heds over the edge. It was marvelous, simply marvelous. A molten river of color, sound and aromas for our enjoyment. We spent a couple of hours lying in the roof until someone spotted our heads hanging over the edge of the roof and sent a law enforcement officer after us. He came up one side of the building’s roof, and we ran down the other disappearing into the crowd. That is probably my best trip (soto speak) to the Fair. Or perhaps a close second. First may be when, while attending the rodeo held in Dorton Arena during the Fair, a rider and horse in the the bucking bronco competition, crashed through the fence falling virtually on top of my family. It literally scared the pee out of my cousin and I got splattered with horse blood coming from cuts caused by the torn wire fence. That was exciting. And I got to see Clayton Moore, the Lone Ranger, on the same day. Maybe that was my best trip to the Fair. 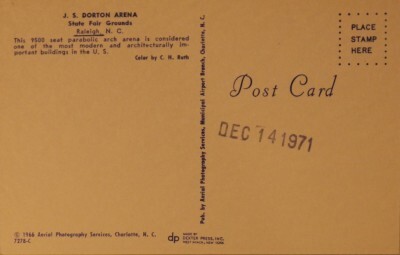 I remember the Dorton Arena, as a child in Raliegh, in the early 62-65 era. We lived on Boundery St in “historic Oakwood” before it was historic. I remember going to the arena to see shows of “The Worlds Strongest Man” brought to that place by The Young Mens Christian Assoication. Along with menories of the NC State Fair. While in grade school @ Murhpey Elementry School about the same time. The teacher would line us up for “early dismissal”, handing each child a Fair Ticket. Our family lived at 615 Boundary Street from 1947 to about 1972. Was that N. Boundary or S. Boundary Street?